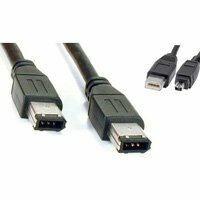 We often get asked for firewire cables so we've decided to stock them. This is the 4pin - 4pin version, in 1.8m length, all top quality and all guranteed for life! (The 4.5m versions are the Belkin Pro Series). Need more details or help in selecting the right cable then click "features". Remember when comparing these cables that these are "premium" cables with VAT included. All camcorders use a 4-pin connector for their 1394 interface wheras nearly all computers use a 6-pin connector for their 1394 interface. So, you need a 6-pin to 4-pin configuration to connect a computer to a camcorder. If you want to transfer video between two camcorders then you need a 4-pin to 4-pin configuration. If you want to conenct external disk drives or other storage peripherals then you'll typically need the 6-Pin to 6-Pin configuration.